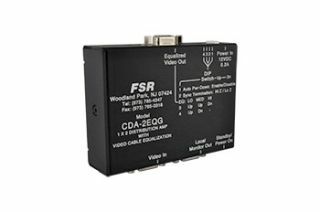 At InfoComm 2012 FSR will introduce enhanced versions of their high-resolution 1 X 2 computer distribution amplifiers that maintain signal integrity while dramatically reducing power consumption.The new CDA-2EQG and CDA-2EQGA, with stereo audio, satisfy applications where a local monitor is needed along with a remote display device requiring a long cable run. The enhanced models incorporate all of the benefits of their predecessors, including ultra high bandwidth, flat frequency response, local monitor output and second monitor output with integrated line driver and cable EQ. Additionally they feature a “green” automatic power down feature that reduces standby power consumption to less than 50mW, a reduction of over 95%, and an advanced sync output circuit that helps provide reliable display operation even with improperly terminated cables.